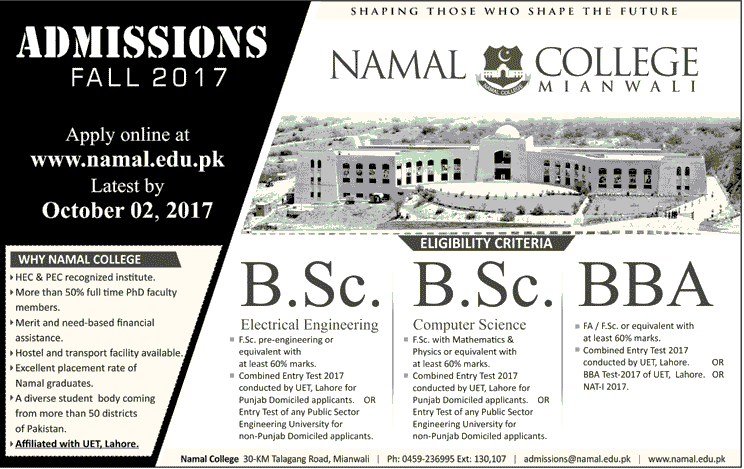 The Namal College Mianwali has invited applications from candidates who want to seek admission in BSc (Hons) Computer Science and BS Eng Electrical and Electronic Engineering. According to the announced schedule by the authorized department, the application forms for admission will be available online from 2nd October, 2019 and all interested individuals can submit their applications to the authorized department till the end of mentioned month respectively. As you can see from the above weight-age, the NTS entry test has the highest contribution in the calculation of final merit which makes it extremely important to pass the test with high marks. So in order to help you in this case, we have provided free online MCQ’s tests through which all candidates can prepare for their Namal College admission 2019 NTS test in the best possible way. Along with this, the complete result of the NTS Test and final merit list of selected candidates for admission will also be available here immediately after their announcement by authorized department. So keep visiting us on regular basis for all latest updates about Namal College Mianwali admissions 2019.